Okay, so this one time? Today is Memorial Day. Summer is now officially open for business. Up here in the north land, Memorial Day is when the swimming pools open up. It's when public parks turn on the drinking fountains & put out the portapotties. It's when we throw caution to the wind and finally plant the darn tomatoes, late season blizzards be damned. It's also the day our nation sets aside to pay tribute to the men and women who've died while serving in our armed forces. This is not a surprise to me. Nor should it be at the end of my What Memorial Day Means to Me list. My dad served in a National Guard unit in the sixties. My Uncle Harry was Air Force. My grandpa served the Army in WWI. My father-in-law spent his entire career in the Air Force, and my brother-in-law flew fighter jets for the Navy. My Uncle Bill was...well, he was colorful. As I believe a lot of sailors are. But they all came through their service --thank God--healthy & whole. And they brought stories with them when they came home. Lord, the stories these men brought home. My Uncle Bill especially. When we were kids we never got tired of hearing the one where he was standing guard on some ship & did the whole "Halt, who goes there?" routine on a superior officer named Marvel. A captain, as it happened. Captain Marvel. Uncle Bill: "Halt! Who goes there?" UB: "Riiiiiiight. Really, now. Who goes there?" CM, with strained patience: "Captain. Marvel." UB, skeptically: "Mmm-hmm. Mmmm-hmm. Captain Marvel?" UB: "Can I be Superman?" Apparently, they really do make you peel potatoes for mouthing off in the military. That's not just Beetle Bailey stuff. At least according to my Uncle Bill, who--admittedly--wasn't the most reliable of sources. We were never sure when we were kids where the line was between fact & fiction when it came to his stories, but it hardly mattered. That wasn't the point. It was all about the story and the picture he painted with his words and that three-pack-a-day-and-a-shot-of-whiskey voice. Now when most people die, their friends and relatives tell stories about them at the funeral. When my Uncle Bill died, we told stories about his stories. It was a powerful reminder to me of how important stories are. They're an honor and a tribute, a temporary recreation of something fleeting and human. They're a kind of m agic, really. And I can't think of a better way to recognize the service and sacrifice of our soldiers than by performing that particular magic in their honor. It's war story day in the Lair! Pull up a log, sit around our virtual campfire, have a beer or a soda or a s'more and tell us about your favorite soldier. 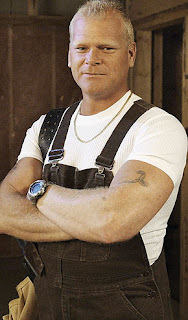 I'll bet I'm not the only one with an Uncle Bill hanging out in the family tree. Come on--share! The DH and I just returned from a little jaunt to Utah and Colorado for our anniversary, and a fun time was had by all, especially when I discovered both The Wild Sight and The Treasures of Venice in the Pikes Peak Library District collection! We had visited Arches National Park and then Canyonlands both in Utah before we decided to drive up Pikes Peak in Colorado. Unfortunately, when we arrived at the ranger station, we were told that the summit was closed due to 90 mph winds! ACK! We definitely didn't want to go up there even if they would have permitted us! Instead, we drove back into town to the historic section called Colorado City. As soon as I spotted the beautiful old Carnegie library building, I urged my DH to stop. The library I'd loved so much as a child was a Carnegie building too! My DH dropped me off and I went inside to check my email. Since I didn't have a reservation, I could only use the internet for 15 minutes, but that was enough time to get my daily fix! So when I was done, just for the heck of it, I decided to put my name in the library 'author search.' To my complete surprise and delight, both The Wild Sight and The Treasures of Venice popped up! Matter of fact, The Treasures of Venice was in the very library branch where I was standing! With my heart a-flutter, I logged off the computer and went in search of 'the paperback collection.' After a few minutes of walking around, I discovered that all of 'the paperback collection' was contained on two sets of bookshelves (this was a small library after all). And there was MY book, on the top of the second set of shelves! How lucky to have my name start with "M" because A through L occupied the first shelf and M through Z the second. With such a small collection of paperbacks, I felt even more special to have The Treasures of Venice included! Best of all, as my DH pointed out when he came in a few minutes later and I dragged him over to see, the pages looked ruffled. Someone had definitely checked the book out and read it! I spent many happy hours in the library as a child and even more as an adult, so finding my book in a small library in another state was a very big thrill for me! Plus this was my first time seeing any of my books actually on the shelf in any library. As a child, I used to read all those author names on the spines of all those books and imagine how wonderful it must feel to have a book you wrote sitting there for people to read. Well, now I know, and IT FEELS GREAT! What about you? Do you have any special memories of libraries? Please share them with us here in the Lair. I know I missed the recent late night reading session, but we can certainly have another one. Please share what you are reading for this lovely weekend. SHHHH! Just don't tell Sven, the gladiators, and the new guy, Paolo! On this day 40 years ago, in a small town in Kentucky, I was born. No matter how many times I do the math, I can't believe I'm 40. I don't feel 40. In 1453, Constantinople fell to the Turks, who renamed it Istanbul. In 1765, U.S. patriot Patrick Henry presented the Virginia Resolutions and said, "If this be treason, make the most of it." It was his 29th birthday. In 1790, Rhode Island became the last of the original 13 colonies to ratify the U.S. Constitution. In 1848, Wisconsin became the 30th state. In 1903, Bob Hope was born. In 1917, John F. Kennedy was born. In 1953, Sir Edmund Hillary and Tenzing Norgay became the first mountain climbers to reach the summit of Mt. Everest. In 1958, Annette Bening was born in Topeka, Kansas. In 1959, actor Adrian Paul (of TV's Highlander) was born. Okay, everyone, play along. What historic things happened on your date of birth? With whom do you share a birthday? And for everyone in the U.S., have a happy and safe Memorial Day weekend. Enjoy those cookouts! I know I will. Congratulations, girls! Please email me on anna@annacampbell.info with your snail mail details and I'll sort out your books for you! After yesterday's blowout in the Lair with Anna's launch party, I think most of us need a day of recovery. So today's blog is a salute to ways to waste time. Some of these ways will be very laid back and lazy, others might surprise you. 1. Reading.Yep, my most favorite way to waste time is to read. From the time I brought home my first library book to this very afternoon, I find nothing more enjoyable than wiling away the day or evening or night with my nose in a book. This drove my father crazy. (Note: I said father. My mother was my enabler, supplying me with various books and authors over the years.). About once a month my mother worked late and it fell to me to cook dinner. Well, I figured that if I had to be stuck in the kitchen cooking, I could read while things were cooking on the stove or in the oven. Especially if I was reading a Kathleen Woodiwiss or Johanna Lindsey book. I mean, what's a burned hamburger compared to the emotions and intrigue in those books? Dad's idea of wasting time was my idea of multi-tasking! 2. Watching TV. Yes, I love my DVR. I can record my shows during a baseball game or while I am at work and get caught up when my insomnia hits or when I'm not quite ready for bed. 2 AM is early for me! Now, mind you not all my favorite shows are crime shows or cooking shows, despite what my hubby will tell you. So what treasures did I find today? Some pictures I'd meant to scrapbook. My latest credit report...been looking for that for a while. Some cards from former patients and some from my kids I want to put in my private momentos box. See treasures! One writer's waste of time is another's answer to writer's block! I also came up with the idea for this blog and managed to write a few pages on a side project titled, and yes this is it's actual title, "An Attempt At Regency". So, that's some of my time wasters...(and we didn't even cover Bejeweled Blitz on Facebook). What's yours? Any particular ways you like to waste time? Do you find side benefits for them? Anything someone else does that you think is totally unproductive? 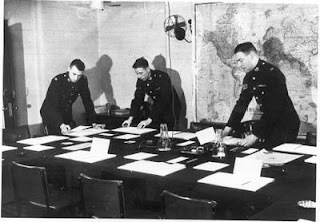 Scene: The Bandit War Cabinet Room which is even further underground than the Writers Deadline Cave which featured in all its fiendish glory in Christine's launch at the beginning of the month. We interrupt this bulletin to bring you an important message! PLAGIARISM GURU: This is looking suspiciously like Christine's launch! PG: Is that all you've got to say for yourself? SA: Well, not really! I've got a whole launch post ahead of me. It would be a bit sad if I stopped now, wouldn't it? PG: Don't play clever with me, Bandita! SA: No, sir! I'd just like to point out that imitation is the sincerest form of flattery. PG: Tell that to Madam! SA: I will! OOH, CHRISTEEEEEEEEEEEEEN!!!!! We interrupt this message to return to our original message. That's right the Bandit War Cabinet Room where all the REALLY fiendish plans are hatched. Oh, no, now the rooster is keen on coming down. He thinks a hatchery means some hot chicks. Anyway, as you can see, it's party central down here. Just look at this embarrassing photo of the hijinks on our New Year's Eve party in 1943! And we can promise you more of the same tonight, oh, yessirreeeee! Batten down those hatches! Iron those hankies! Match those socks! Speaking of embarrassing! There's been a major hitch in our planning for today's launch of the new Anna Campbell opus MY RECKLESS SURRENDER! Oy, oy, oy! And assorted other Bandita cries of despair! Including the famous Ai Caramba! And "Demetrius, what are you doing with that sword?" 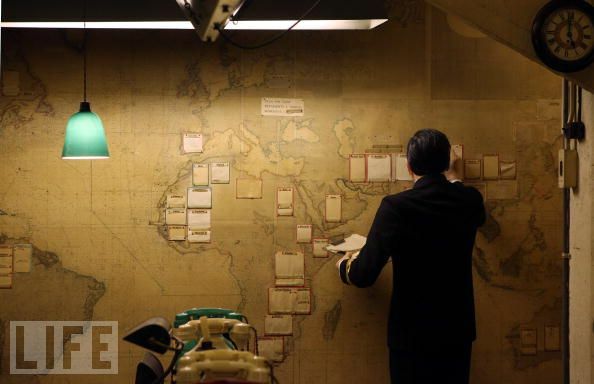 It turns out the top secret documents, essential for today's mayhem, have been diverted to Africa. We need to get them OUT OF AFRICA!!! Snort. Feel the urge to break into a Danish pastry! Oh, get lost! No time for jokes when our launch is going haywire! Anna Campbell runs around like a chook with her head cut off. Oh, no, the rooster just keeled over in shock! Not you, GR! Just a generic chook! A GENERIC CHOOK, I SAID! Lordy, why is everyone I work with a drama parrot? In the absence of detailed plans for today's launch, we turn in desperation to you, Banditas and Bandita Buddies! Give us three reckless things to do in the lair today to celebrate the release of MY RECKLESS SURRENDER! The best suggestions will win one of THREE signed copies of MY RECKLESS SURRENDER! Unless the books have gone to Africa too. But I have it on good authority that the books are walking like an Egyptian and they at least will be here for distribution before the end of the night! STOP PRESS: A shipment of naked Regency rakes has been captured off the shores of Tripoli by roving renegade Banditas. And they will soon be here to assist in any nefarious plans! So come on, people, give us some nefarious plans! Otherwise we'll have to put the rakes in the shed! 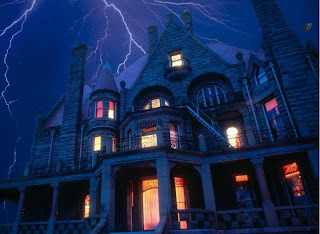 Rain lashed the Lair's windows (mullioned casements in the historical wing, sliding sashes in the contemporary area and the kitchen). Wind howled around the stone walls. In the kitchen, Sven sat with Paolo, the new cabana boy, to help him with his first night shift. "I'd say it's a dark and stormy night," Sven muttered, "but they have a rule against that particular line." "I don't get it," Paolo said. "If none of them live here, why do we have a night shift? Why do they care what we say?" "They're writers." Wearing the Roman-style tunic, leather cuirass or chestplate, and short sword of a gladiator on duty, Marcus strolled in from the gladiator villa, as he and his comrades called their barracks. They pretended not to know the cabana boys called it The Sty. Sty, hah! They should've seen the lion pit under the Colosseum. He yanked open the fridge and peered inside. "They keep weird hours. It's almost like a rule. Besides, that 'dark and stormy' thing has a history of some kind." Sven frowned at him. "Pick something or shut the door." "Yes, Mater." Marcus chose a beer and let the door swing shut. "It could be worse. At least the dragon's asleep. Zach finished the repairs in her cave earlier." "Dirty beast," Paolo muttered. He'd never forgive her for singeing his trousers when he left after his job interview. He'd taken the position only because it came with very attractive hazard pay. And did not require dragon wrangling. Not officially, anyway. Demetrius walked in from the dining area, his sandals slapping on the oak flooring. "All secure. Some of them are up in the library, supposedly working." Glancing at Marcus's beer, he added, "Any more of those?" "In the fridge." Marcus pulled out a chair. Plopping into it, he kicked off his sandals. At least these modern ones came off easily, allowing barefoot traction on any of the Lair's varied floor coverings in case he needed to fight something. With the Lair connected to the real world by a tesseract and people writing paranormals and fantasies and other tales of mayhem, you never knew what might suddenly pop out of air to confront you. He shook his head. Why couldn't women pick one type of floor and just go with it? He stuck his feet on the table, ankles crossed. "So, guys--"
"That's a food prep surface," Paolo snapped. Sven rolled his eyes. Marcus and Demetrius both glared. "Uh, sir, I mean," Paolo added with a quick nod at Marcus. "I can certainly clean it later, sir." As the two gladiators grinned, Sven sighed. "Don't indulge them." Demetrius closed the fridge, popped his beer and sat next to Marcus. Eyeing the scowling Paolo, he kicked off his sandals and slowly raised his feet onto the table. "Not like Sven doesn't wash the table every time he turns around anyway." "Yes, because people get it dirty." Sven cast a pointed glance at the gladiators' bare feet. "Disinfectant costs money, so take your feet down. Donna came in here after that last party, and she was not happy about all the repairs. You gladiators need to keep a closer eye on things. Especially that diabolical bird." The gladiators exchanged an amused glance, and Demetrius shrugged. "You're in charge of entertainment. 'Course, it's hard to be in charge when you're laid out under the table, like at that last blowout." "Which is the only kind of party they have," Marcus said. "There's another one tomorrow, you know. Anna Campbell's new book." Sven scowled. "Great. Just great. More cleanup. As for last time, I couldn't help it. Someone hit me." "Probably the bird," Marcus said. Maybe that would cut off the budding spat. Listening to Sven and Demetrius snipe could be amusing, but he wasn't in the mood for it tonight. "Who has him today, anyway?" "Someone far from here, I hope," Paolo said as Zach, the head hockey hunk, wandered into the kitchen. "I can't imagine why those buddy people WANT him!" Hiding grins, the others eyed him. His one encounter with the notorious Golden Rooster had ended with him wrapped in various crepe paper streamers and covered in punch. He still refused to explain. "Not 'buddy people.' Bandita buddies," Zach said. "You'd better learn the lingo if you want to last around here." "But there's so much of it." Shaking his head, Paolo sighed. "Demetrius, what do you mean they're 'supposedly working' up there?" "It's too quiet." Demetrius frowned. "Usually there's that clatter from keyboards. Or whine from printers. Or 'hey, can you take a quick look at this' kind of stuff. Tonight, nothing." Zach headed for the refrigerator. "Maybe they all left. Forgot to turn out the lights or something." "They're kinda spacey sometimes, some of them," Demetrius said. "Distracted. It's a wonder nobody whaps 'em upside the head and robs 'em." "Yes, well that's what you're here to prevent." Zach opened the fridge, chose an apple, and shut the door. His quick decision earned an approving nod from Sven. Zach sat next to Marcus, leaned back, and propped one ankle on the opposite blue jean-clad knee. "You'd better remember, some of 'em know how to throw a punch." With a crunch, he bit into the apple. "A girl punch." Demetrius chuckled. "Ooh, I'm so scared." "I've spotted for them in the gym," Marcus said. "They hit harder than you think. Know how to blow things up, too." Frowning, he took a sip of beer. "I think some of them actually have. Blown things up. Got that arsenal, too, and a few of them know which end of a gun to point." "Don't forget the nurses and their knives," Sven said. "Scalpels." Demetrius took his feet down. Shifting uneasily, he said, "Hey, you didn't see that Goddess Sangria around, did you? She--" A buzzer interrupted him, and he jumped. As the others grinned, Paolo hurried to the box by the sink. Pressing "talk," he said, "Uh, yes, ma'am?" The other men winced. "No ma'am-ing," Sven said softly, shaking his head. "Hey. Who's this?" came crackling out of the speaker. "Cassondra," Zach mouthed silently, making air air quotes with his fingers, "the 'vampire.'" Paolo shot him a grateful look. "Uh, it's Paolo. In, uh, the kitchen, ma'--uh, Cassondra. 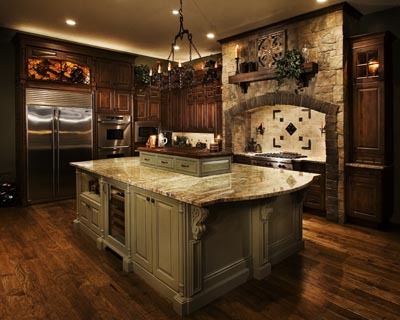 The kitchen." "I know that, thanks," she said. "Listen, we could use a snack up here, please. Just the usual stuff." "Uh..." Paolo glanced at Sven, who made move it along motions with one hand. "Uh, right. The usual." "For nine," she said. "Thanks." Zach whistled. "Nine. More of them here than I thought." "Which makes it ominously quiet, for that many of them in one place." Looking thoughtful, Marcus rubbed his chin. "The 'usual,'" Sven said to Paolo, "means nachos, chips and dip, wine, tea--iced and hot--and soda. And maybe a pitcher of the smoothies. Jeanne especially likes them. And the leftover desserts from Beth's launch picnic." Gaping, Paolo said, "How many did she say were up there?" Sven ignored the question. "I'll help you put it together." "I'll do the nachos," Zach said. "So we have enough." The gladiators leaned back in their chairs. The more food went upstairs, the more they could wrangle for themselves. "Snacks are on the way." Cassondra plopped back into the window seat overlooking the front gate. "It was that new guy. I think he's afraid of us." She scrunched up her face and wiped at a fingerprint on the stainless-finished Sig Sauer P226 on the cushion beside her. "Or maybe he's just afraid of ME." "Can't imagine why." Grinning, Suz directed a pointed look at the weapon before going back to her book. The crackling fire warmed the various seating nooks. It cast a golden glow over the Oriental and Aubusson carpets, walnut paneling and conference table. Heads bent over books, banditas lounged on the cozy room's overstuffed furniture. The warmth and light provided a pleasant counterpoint to the rain still beating the mullioned windows and the wind rattling the myriad tiny panes. "It's really coming down," Cassondra said. She stretched to put her feet on the big hassock the banditas moved around when they needed extra seats. "Uh-huh," someone answered absently, too fast for her to tell who'd spoken. Aside from the sounds made by the storm and the fire, only the occasional rustle of paper or ssss of a finger sliding down a turning page broke the silence inside the room. On the couch by the hearth, Kirsten shifted positions with a soft shushing of jeans against the leather upholstery. Susan, who sat by the opposite arm, moved the pillow behind her back without looking away from the page. Nancy sat up from leaning against the hassock, put a finger in her book to hold the place, and rolled her shoulders. "Oh, wow. It's three a.m. already!" She glanced over at Cassondra. "We should get some food up here." "On its way," Cassondra said, accustomed to the obliviousness of reading banditas. "Thanks." Nancy cocked her head. "I think I hear the dumb waiter cranking." "And the clop of gladiator sandals on the stair carpets." Surfacing from her own book, Donna stood and stretched. "Somebody must be bored on security detail." "Or hungry," Jeanne suggested from her chair by the window. The conversation pulled the various banditas back to reality. Their heads lifted, and their eyes turned toward the doorway. Banditas did love their food. At the table, Anna Sugden laid her book aside. "Well, no one's likely to break in tonight." "Unless they're desperate," Christine put in, sliding off the divan opposite the window seat. The agreeable rumble of male voices drifted into the room, and then Demetrius's baritone became distinguishable. "...give you cabana boys credit--"
"However reluctantly," Sven said in a dry voice.
" --you know how to put together a spread," Demetrius finished. Judging by the sound of his voice, the guys had reached the dumb waiter near the stairs. "They do know how to feed us," Jeanne said. "They really do." Nods of agreement answered her as Sven muttered, "It helps when certain people don't eat all the food before I have the chance to fix it." "What's everybody reading?" Cassondra asked. "I'm starting my 'summer of re-reads' and I'm starting with The Courtesan's Daughter, first book in Claudia's Courtesan series. I'd never even heard of TICD (The Incomparable Claudia Dain) until Posh brought her into the lair for an interview. Claudia's a nice lady too. But now I'm hooked. And I blame Posh. Of course, I'd be up anyway, not like some of y'all." "I like those books," Nancy said. "If someone had told me you could put Native Americans in Regency England, I'd have said, 'no way,' but Claudia makes the combination seem natural. Great characters, too, and a way cool marriage competition plot in that particular one. But I can't blame Posh. I picked them up on my own." "I love the heroine in this book," Cassondra said, "because she's gutsy. And I love the non-traditional background of her and her family, and in particular how it's woven through this book in just the right places. It was a fresh approach to the "exotic courtesan." Suz chuckled. "Well, if we’re blaming people for hooking us on books or authors, I blame Addison Fox for my addiction to The Black Dagger Brotherhood! Today I just got my copy of JR Ward’s newest book, Lover Mine. Sigh. I adore this series. Who knew? Me, the person who really doesn’t like vampire books, never watched Buffy, (yes, I know I’m an oddity), but from the moment I was handed my copy of Dark Lover, I was hooked. I devoured that book then needed more of the Brotherhood. What was a girl to do? The next in the series wasn’t due out for months!! Egads! I immediately went to JR’s website where she had interviews posted with the brothers. OMG, it only whetted my appetite for more." "So if you didn't love Buffy--and I didn't watch it either, I confess--why these vampires?" Nancy asked as Paulo led a procession of tray-bearing men into the room. 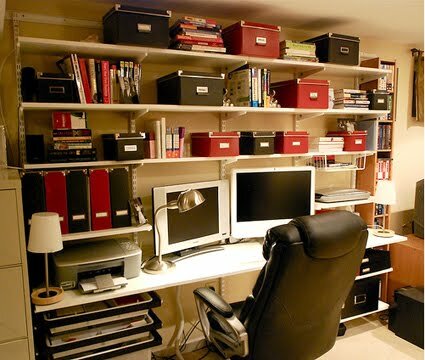 Paulo glanced around the study. He hadn't been up there much. His scan took in the window seat and the weapon on it, and he blanched. Then he stepped sideways, away from the gun, with a nervous look at Cassondra. She favored him with a sweet smile while Susan, Anna S., and Kirsten, noticing the byplay, grinned. The gladiators snickered and shook their heads. Sven merely sighed. "I knew it wasn’t that these guys were vampires," Suz said. "I hardly noticed the parts where they needed to feed off others to exist. Nope, it was the guys themselves, their larger than life bodies, personalities and flaws. With each book I’ve gotten drawn further and further into their alternate world. As the series becomes more urban fantasy instead of straight romance, I find myself going there…and liking it! Jeanne and Nancy shared a triumphant another-convert-for-the-subgenre look. "Welcome to the club," Jeanne said. Zach and the gladiators helped the cabana boys set out food on the long table. The gladiators nicked a few nachos in the process, earning glares from Sven. “So that was the big box the Amazon Pigeon dropped off earlier.” He frowned. “I thought you weren’t doing that glomming thing again. You promised after Suz introduced you to Julie Garwood’s Saving Grace and Lorraine Heath’s In Bed with the Devil." Casting an envious look at the massage in progress, Christine filled her plate. "As you all know by now, I blame Anna Campbell for many things--not least of which is getting me addicted to her roast chicken and potatoes and Brumby's raisin toast!--but the main addiction she's passed on to me is a love for C.S. Harris's St Cyr mysteries. Of course, any book Anna C. recommends is one I'm guaranteed to devour in a sitting (hmm, there we go with the food again! 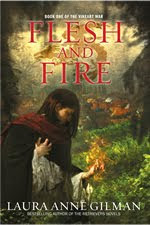 ), but the St. Cyr series has me slavering for more each time I read one." She held up the book she'd been reading. "My lovely agent recently sent me the beautiful hardcover of What Remains of Heaven, which only fed my addiction." Several banditas exchanged knowing looks. "Books are dangerous that way," Kirsten said. Nodding agreement, Christine fingered the stem of her wine glass. "This is one of the best mystery series I've read in a long time because it combines a complex, wounded hero/detective worthy of a romance novel with a rich sensibility of the Regency period in which it's set and a mystery that has more twists and turns than a Seven Dials alley. The romantic thread that runs through the books is an absolute delight and keeps me clamouring for more. I hope this series continues for a long time--I'm already suffering withdrawal symptoms while I wait for the next one!" Donna settled in her chair again, her plate skillfully balanced on the arm. 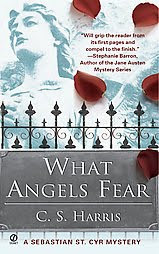 "I also read and loved What Angels Fear by C.S. Harris as a result of Fo’s recommendation. I wish I had bought the whole series at the time and not just the first book. Fabulous characters and sense of setting. There’s so many good books out there. I often start one with great intentions on finishing, but another book calls me away. I finished What Angels Fear – couldn’t put it down, which isn’t such a good idea when on deadline. So I’m not sure whether to thank Fo or curse her name." She finished with a big grin. Paulo circulated with red velvet cake left over from the launch party. Although he tried to avoid the gladiators, Marcus intercepted him and took a piece for himself and one for Demetrius. "Hey!" Paulo hissed. Marcus said something back in an undertone and fingered his sword hilt. Glaring at Marcus and muttering, Paulo straightened the napkins. "I have someone to blame, too." Kirsten ignored the staff dispute and poured herself a glass of tea. "Okay, I still love her. Susan Sey, that is. She's my critique partner, after all, a dear friend and married to my husband's best friend. I'm basically stuck with her for life, so it won't do me a bit of good to run around mad. 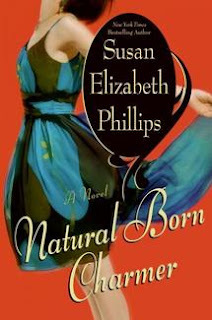 Still,here it is, 3AM and I CAN'T SLEEP because of this damn Susan Elizabeth Phillips book!" She picked it up so they could all read the title, Natural Born Charmer. "Ah, the joys of converting someone," Suz said. "Good choice." "Yes." Kirsten nodded emphatically. "I told her I strictly read historicals and she said I need to try SEP. 'You'll love her,' Susan said. 'She's the best.' Of course, Susan didn't mention SEP is totally addictive, that I'd find myself buying expensive hardbacks just because I couldn't wait a second longer when a new book comes out...and she definitely didn't mention this whole 3 AM thing!! WAH! It's all her fault!!" She held up her book so they could all see it. "So here I am reading Love Only Once. At three in the morning. Again." Familiar with the phenomenon, all the banditas sighed and nodded. "Shades of the TBR pile," someone muttered. Jeanne rubbed her eyes. "Paolo, bring me one of those wonderful hangover cure smoothies you have. No," she answered his unspoken question. "I don't actually have a hangover, but when I read until the wee small hours of the morning it makes me FEEL hungover." Paolo frowned and passed the smoothie in a big frosty glass. "Thanks. Now, don't glare at me. It's Nancy's fault. I told her one of my students in the Body Disposal class I taught for From the Heart Romance Writers mentioned Kathy Reichs." She waved a book with bones on the cover. "They're the books that the TV program Bones is taken from. Nancy said she'd heard they were great. Between the student, and Nancy, I couldn't NOT go get them. I'd read the first one years ago, now I'm burning through all the others. Of course, she also hooked me on Laura Anne Gilman's Vineart Wars series, but the second book isn't out yet." There were groans of sympathy at the wait between books. Paolo frowned again, though no one could tell whether that was because of the hour, the reading, or Jeanne's consumption of smoothies when she didn't have a hangover. Or all three. "Does anyone need a refill?" Jeanne handed him the smoothie glass, empty. "Nope, just tea for now, iced, and sweet. Thanks. Maybe some of those little sandwiches?" Christine motioned to the book with the bones, "Which one is that?" "Fatal Voyage. Fabulous on the forensic pathology, and set in both North Carolina and Quebec. Superb on the crime solving bits, and deeply, mightly engrossing if you're into that sort of thing. And of course, I am." Jeanne grinned at Christine. "Whose is this?" Cassondra held up a paperback. 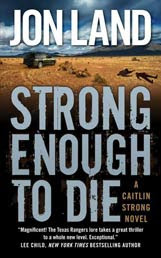 The cover showed a desert scene with Strong Enough to Die written across it. Waving acknowledgment, Nancy swallowed the food in her mouth. She wiped away crumbs before explaining, "KJ put me onto Jon Land. I liked his Middle Eastern thrillers, so I thought I'd give this a try. It's also a thriller, but it's about a female Texas Ranger who's learning the case she thought she'd wrapped up years ago might not be so tightly closed after all. That's partly because the guy she put in prison didn't do it. He's out and wants revenge. But in a terrific twist, he turns out to be the hero. Not that he's an angel, having been an enforcer for the mob and done his share of evil things. He just didn't do the one thing she sent him to prison for." "That's a couple with conflict," Donna said. "Definitely. But it works." Nancy's eyes glazed for a moment, and then she said, "Gotta figure out how. Anyway, they just walked into a trap. So it's KJ's fault I'm here and reading at this hour because I have to see if they survive. And if they end up together, at least kinda sorta, seeing as how this is a thriller and not a romance." "More fun if they do," Susan noted. Silence fell while banditas and staff munched. Zach's fingers slowed as the words in Anna's book caught his attention. After a few minutes, Susan said, "You guys don't have to hang around if you don't want to. We can load the dumb waiter when we finish and send everything down." Sven, who'd been covertly eyeing Kirsten's book, muttered something noncommittal. Zach was blatantly reading now and said nothing. Marcus picked up Nancy's book. "This has mayhem?" Behind him, Christine chuckled softly and shook her head. As he leafed through the pages, Cassondra winked at Nancy. "I'm not done with that," Nancy said, "but I left a couple of others with major boom on the table by the door. Linnea Sinclair, Laura Anne Gilman, Catherine Mann, and Jessica Andersen. And if you want sword work, Gerri Russell's latest is in the library." With a glance at Cassondra, she added, "If you want real vampires, Barbara Monajem's book is there, too." Sven and Paolo drifted to the table she'd indicated, where they peered at the books. Demetrius sighed. "Rounds to make." He punched Marcus on the shoulder, and they stood. Assuming an Austrian accent, Demetrius announced, "We'll be back" as they departed. "I didn't know he'd seen that movie." Kirsten exchanged a surprised glance with Suz. Donna shrugged. "They wheedled a flat-screen TV for their barracks out of the last budget. I think they go for movies that're heavy on testosterone." "They like that Spartacus show," Sven noted. "Also that Rome series from HBO." "Except they won't shut up about what the filmmakers have wrong." Paolo sighed. Banditas opened their books again. Jeanne raised her glass to Cassondra in a silent toast before turning back to Kathy Reichs. Cassondra strolled to the window seat. Paolo eyed her nervously. Giving him a tiny smile, she tucked her weapon behind a cushion, out of sight, before she picked up her book again. Paolo breathed a soft "whew." Sven gave him a nod of approval. Books in hand, they chose seats, and silence descended on the room once more. This was a nod to people who've made our TBR piles grow, and we hope you've enjoyed it. Who made your TBR pile grow, and how? What was the last book you fell in love with but might not have read if it hadn't been recommended to you? What's the next book you plan to pull off the stack? And last, to keep up with the food theme, what do you like to snack on when you read? Earlier this month, I attended the annual Malice Domestic Conference in Arlington, Virginia. This is a very fun fan conference dedicated to the traditional mystery genre, and it's famous as the home of the prestigious Agatha Award. 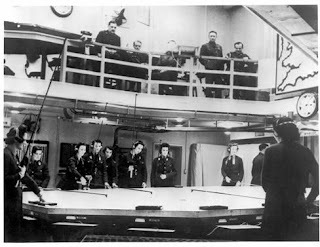 The Malice conference is also famous for an event known as Malice-Go-Round, which has been described as speed dating for authors. 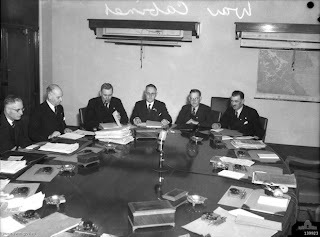 Take one large conference room, mix in 40 authors, add 160 readers sitting at 20 tables, and start the clock. Authors move from one table to the next, where they have exactly two minutes to pitch their latest books and pass out swag such as bookmarks, post-its, key chains and chocolate. Then the authors move to the next table and start their pitch all over again. It's exhilarating, frightening, and surely the most strenuous exercise I've had all year. Hannah Dennison is one of the funniest, most talented people in the world. I've actually known her awhile and love her a lot. She writes the Vicki Hill Mysteries in which protagonist Vicki (who fancies herself the new Christiane Amanpour) writes obituaries for the local newspaper in the village of Gipping-on-Plym in Devon. You won't believe some of the funny, quirky English characters and pastimes (hedge jumping, anyone?) Hannah comes up with in her charming series. Elizabeth Lynn Casey writes the Southern Sewing Circle Mysteries. 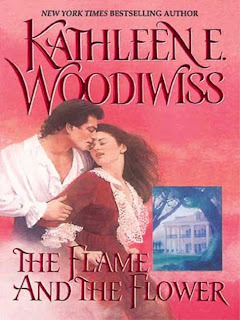 She also writes romance—yeah!—for Harlequin American as Laura Bradford. Elizabeth/Laura will be signing her latest books at the RWA conference in Orlando, Florida on July 28, so if you're there, I hope you'll track her down. I also can't wait for the debut novel in E. J. Copperman's new Haunted Guesthouse mystery series, coming in June (The Night of the Living Deed) and Avery Aames’s new Cheese Shop mystery series debut in July (The Long Quiche Goodbye). Love those titles! Okay, so when the Malice conference was over, my new friends, Hannah and Diana, and I rented a car and hit the road for another event near Pittsburgh. 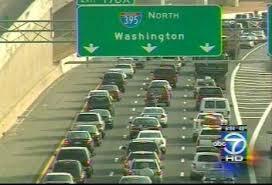 But before we could get to the Pennsylvania Turnpike, we first had to get out of Washington D.C. I was the driver, and yes, I admit I missed an offramp or two. One of them I missed twice. I was confused! The upside is that both Hannah and Diana are Twitter experts. They tried to teach me the ins and outs, but I’m a slow learner. However, I’m determined to become a master Tweeter, so give me a month or two, then follow me! Despite the minor setbacks (and a flash rainstorm that scared the houie out of this California girl), we arrived in time for the annual Festival of Mystery, a one-day mystery writers' and readers' extravaganza put on by the lovely folks at the Mystery Lovers Bookstore in Oakmont, Pennsylvania. They rent out a large hall to accommodate 50 authors and somewhere between 300-400 readers, who circle the hall and peruse the thousands of books available, talk to the authors, and buy up a storm. It's always so much fun to visit with serious book lovers, and these readers are serious! I came home utterly exhausted but I'm already chomping at the bit to sign up for next year's events! How do you feel about attending book signing events? Would you stand in line with 300 other fans to talk to your favorite authors? Do you have a favorite bookstore? And hey, do you Twitter? How’s that working for you? What new authors have you found that you can to recommend to the Banditas? Thank you all so much for helping me celebrate the release of DO YOU TAKE THIS COP? Please welcome Gabi Stevens who is going to share a little magic with us today! Sometimes life gets in the way of, well, life. You have a day job, dentist appointment, a headache, shopping to do, or dinner to make. Something. Anything that keeps you from doing what you want. Let’s face it; life isn’t all about lollipops and unicorns. We have responsibilities and things we have to do, not necessarily things we want to do. So how do we find the magic when life is getting in the way of life? Attitude. One of my favorite sayings is “Fake it ‘til you make it.” Studies have shown that if you pretend to be happy, the actual emotion is more likely to follow. Attitude is everything. Finding the fun in a job you have to do is half the battle to make it a joy instead of a chore. Of course, finding the fun isn’t always easy. But here’s your chance to be creative. Dance while you do the dishes, sing in the grocery store (I confess I have done this. It’s especially fun if you have teenaged daughters who are mortified at your behavior. ), have a laundry folding contest. My husband and I used to play crazy eights to see who had to climb out of bed and turn out the lights. 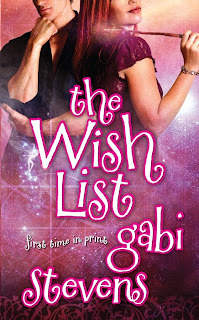 In my novel, THE WISH LIST, one of the themes I hope the reader takes from the story is to celebrate whenever you can. Kristin Montgomery, my heroine, faces many challenges in the course of the story, but she grabs her moments, even if they are just moments. I learned this lesson from my father. He was a man who worked diligently, hated no man, and knew how to play. He always kept a bottle of champagne in the fridge with a back-up case in the garage just in case. I’ll never forget the time my husband and I, driving from Illinois, arrived for a visit at 2:00 AM. After we woke my parents up, my father immediately popped open a bottle to celebrate our safe arrival. That’s right. At 2:00AM. Magic is everywhere if you look for it. I don’t mean the take your wand out and zap yourself a hot fudge sundae. I mean the moments that are filled with laughter, satisfaction and love. The ones where you win the Monopoly game, or sing to a great song on the radio as you’re driving with the window down, or just smell the lilacs in bloom.When you make that perfect pot roast (a moment that still eludes me--I am not a cook), when you get recognized at work for just being you. Magic moments can happen at any time; you just have to recognize them. Or create them for yourself. I hope you’ll enjoy my novel, THE WISH LIST. It has actual magic in it and a whole bunch of magic moments. We'd love to hear about your magic moments! Please feel free to share ones that you've experienced, or ones that you would like to experience. Thanks for joining us today Gabi!!! Gabi Stevens was born in SoCal to Hungarian parents. After spending time in boarding school, college, and studying abroad, she’s still in the classroom trying to teach eighth graders the joys of literature. An award winning author, Gabi writes in New Mexico where she lives with her robotics engineer husband, three daughters, and a neurotic dog. She loves to play games, has a wicked addiction to reading, avoids housework and cooking, and doesn’t travel nearly as much as she would like to. Her latest book is THE WISH LIST, from Tor Books, May 2010. It is the first book in a trilogy. You can reach her at PO Box 20958, Albuquerque, NM 87154-0958 or through her web site at www.GabiStevens.com. I've been really taken by the spontaneous dance videos that are popping up all over the internet. I'm sure you've seen some of these. They all start the same way - a crowd of people milling about, doing what a crowd does. Suddenly music is broadcast, someone starts to break out in dance - then more people join in doing the same choreographed moves. When the music stops, the crowd disperses. I love it! I want to be in a flash mob dance. Here's one of my favorites (for many reasons). One - the venue is my alma mater, Ohio State University. They just opened a new student union (which, in my opinion, looks a lot like a shopping mall). Jordan Davis organized the flash mob and the Jordan is (Two) from my home town. Man - if only she would have called. They let the old geezer University President in the video (he's the one accompanying Brutus Buckeye, the school's mascot) so surely they could have found a place for me (grin). (Three) I believe in this song - Don't Stop Believing and (Four) I love the Glee version. Here's the flash mob video. BTW, it took two months of secret rehearsals to coordinate the seventy student dancers. I read that the whole phenom started with a "spontaneous" pillow fight in a public venue. That was followed by a public freeze for five minutes in Paris. The music and dance adds a much better component, plus the songs are always so upbeat. Here's another one that makes me want to sing along. Here's another video to get you moving. The Black Eyed Peas singing "I've got a feeling." The performance was to kick off Oprah's 24th(?) season - but she didn't know about the flash mob. Do you see that crazy girl in the front dancing like crazy? That would be me (grin) - no - that's not me in the video, but I'd be the crazy one dancing when everyone else stood still. Sometimes the music just gets in you. So how about you? Are you a flash mob fan? Have you ever been in a flash mob video? Want to? It's a kick-back Sunday so let's have some fun. Summer has arrived here in England (for this week, at least!). Temperatures are hovering pleasantly in the high 70's, cricket is being played on the village greens and the best sign of summer of all ... the tinny notes of 'O Sole Mio' (better know to us over here as the music from the ice cream ad - Just One Cornetto) ringing across the neighbourhood as the ice cream van plies its trade. The first ice cream van aka Mr Whippy (though, these days they aren't all the real deal!) appeared last weekend and all the neighbourhood kids (young and old) lined up for their favourite summer treat ... the 99. (see pic left). No idea why it's called a 99, but up and down the country everyone loves them. The real 99 is a whipped ice cream with a Cadbury's chocolate Flake stuck in it. For special treats, you can have sauce on it - strawberry is my fave, though the kids like the blue one! You can also have an extra Flake! The ice cream vans of my childhood also had a wonderful array of ice lollies - who wanted boring vanilla ice cream (even with the added extras) when you could have a Lolly Gobble Choc Bomb or a Zoom or a Fab?! Other fond memories of the pre-Baskin Robbins, Haagen Dazs and Ben & Jerry's days are the ice cream desserts ... the Arctic Roll, the Neapolitan and (for the posh folks) the Vienetta! And then, the really special treats ... the banana split and the knickebocker glory. When I was a teenager, we lived in Virginia and there was a Farrells Ice Cream Parlour nearby. One of my favourite birthdays was at Farrells - complete with a Pikes Peak for the whole table. I couldn't find a pic of it, but the thing was HUGE! Don't get me wrong, I love favour varieties too. My best friend growing up and I bonded over our love for mint chocolate chip ice cream. But, you can't limit me to one scoop! How can I choose between mint choc chip and strawberry cheesecake, Chunky Monkey, Cookie Dough, banana split, Cherry Garcia and the late lamented Uncanny Cashew and Wavy Gravy?! Mmm ... time for the yummy boys of the ice to delve into the Lair's freezer and serve up some ice cream. So, grab a hockey hunk and give him your order *g*. [For P226 and any other BB males - we have some ice girls on hand too! But you'll have to be quick, those gals can really skate!] Triple scoops all round! Do you have any fun ice cream memories - favourite desserts, ice lollies or other chiller delights? Do You Take This Cop? Launch Picnic! Getting to the Bottom of Things! Jo Davis brings another Firefighter to the Lair!